I love you. I’m sorry it has been such a challenging time. I don’t have PPD or depression and I still know the feelings of being trapped and the frustrations of dealing with the kids on my own for a period of time. So I can’t even imagine what it’s like for someone with PPD. It angers me that people think it’s a money conspiracy by pharma companies when it comes to issues that require medication, and they say, don’t do it, they just want your money! Some people NEED these meds. Some people need those vaccinations (yup, I still feel strongly about getting vaccines for children). I love you too. Thank you for always “getting” me, friend. Love you, Katie. Sending you hugs and love and all good things. You’re strong and amazing and you have an army at your side, your back, wherever you need us. Love you too, Andrea. Thank you. I love your openness, your honesty. You’re giving a voice to what so many feel. Thank you and I’m so happy we met. It’s good, I think, to put it out there that those of us who have suffered with ppd and never really got over it, understand it when women snap like that. When I read about the stories I know it could’ve been me. I hope the sun shines on you a bit more tomorrow. Thank you. What I’m going through right now is so similarly triggered by being alone with my (beloved) child for very long days. Thank you for sharing your story. I am constantly reminded that I am a much better mother when I am working. I do not have the chops to be a stay at home mom. I really wish I did because I do love my kids so very much, but a lot of alone time with them is very triggering for me. Love and light to you as well. Big hugs Katie. I haven’t been through what you have but when I find myself at snapping point with my kid I put him on a screen so I can get a break! Bad for him but good for me.. I love your hugs, Jennie. I wish I could get a real one because your hugs are incredibly healing. Love you. If she’d just said “medication” instead of meditation. Grrrr…. obviously you know how I feel about this one too. And how hard this can be on us, as mothers, women, wives. I suppose it is hard for some people to understand, I guess, if they are blessed not to deal with it or go through it. But still, understanding is key. I love my pills AND I love my kids. You can do both. YES! I love my pills AND I love my kids!! < --THAT! 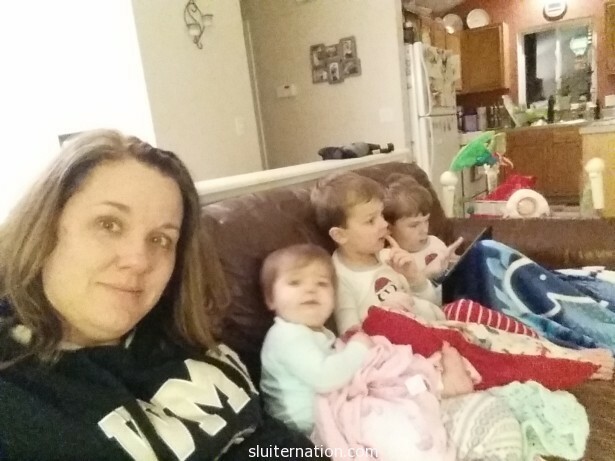 xxoo Katie recently posted…Family Adventures! Just exactly what Elaine said. Love you, Katie. It amazes me that in such a short time between when I had my kids and now that screenings for PPD would be a thing. I barely thought about it when my kids were small, and who knows if I would have failed a screening? But of course back then there were mothers who drive their cars into lakes and drowned their babies in bathtubs and everyone wondered what kind of a monster would do that, and I thought to myself, well, I could do that. Seriously. I have thought “well, I could do that” many times. Glad we are not alone. And glad we DIDN’T do that.